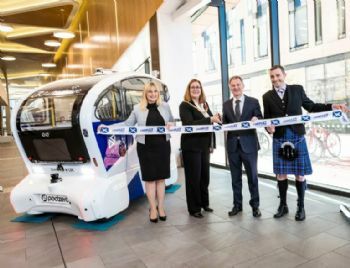 The Scottish transport sector is to benefit from greater access to funding for new projects that support business growth and create improved traction in the Intelligent Mobility global economy, thanks to the Transport Systems Catapult opening a Scottish base. This is intended to harness Scotland’s on-going efforts to transform the future of the transport industry, in line with the Scottish government’s long-term goal of fostering a smarter, healthier, safer and ‘greener’ environment. The Transport Systems Catapult is at the forefront of Intelligent Mobility and was the first organisation to put a self-driving vehicle on UK streets. It showcased the results of the ‘driverless pod’ project at an event for industry leaders at Strathclyde University’s Technology and Innovation centre. Helen Wylde, chief engagement officer at the Catapult, said: “There’s huge potential for Scottish universities, government and SMEs to play a central role in the development of new transport innovations and ultimately realise life-changing benefits for consumers while creating more-efficient and environmentally friendly choices.